ENGLAND – At age 16, Dorothy Howe took her first drag of a cigarette. 84 years and roughly 460,000 cigarettes later, the former secretary credits her longevity to all that smoking and a little bit of whisky. According to the Daily Mail, Dorothy’s brand of choice is Superking Black and her daily habit of about 15 cigarettes has probably cost her about £193,000 at today’s prices. 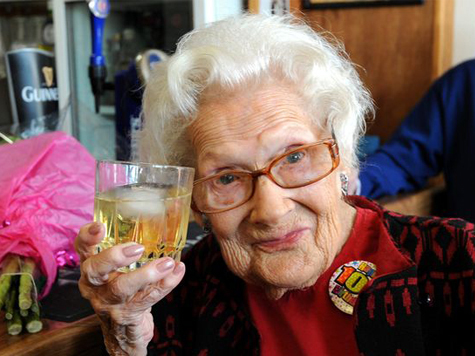 On her 100th birthday, friends took Dorothy out to a local watering hole for a couple of drinks. When she returned home, she opened a card from the Queen. Dorothy who never had children, still lives in her home in Saltdean, East Sussex. Her husband of 26 years died of cancer in 1993 at the age of 60.